My previous post on the subject of soup is actually the most visited page on this blog so far. So in the spirit of giving the people what the want, I decided to do another one. Not merely for the sake of it, but also because Sunday is usually soup day, and it was Sunday yesterday, and therefore I made soup. In conclusion, it's not blog posts the people want: it's soup. Microgreen 'Rambo radish' sprouts. I've grown these over the last week and now have a healthy tray of shoots to throw into soups, salads and my mouth. They have a mildly bitter taste to them. Celery leaves. Used these in the previous soup. 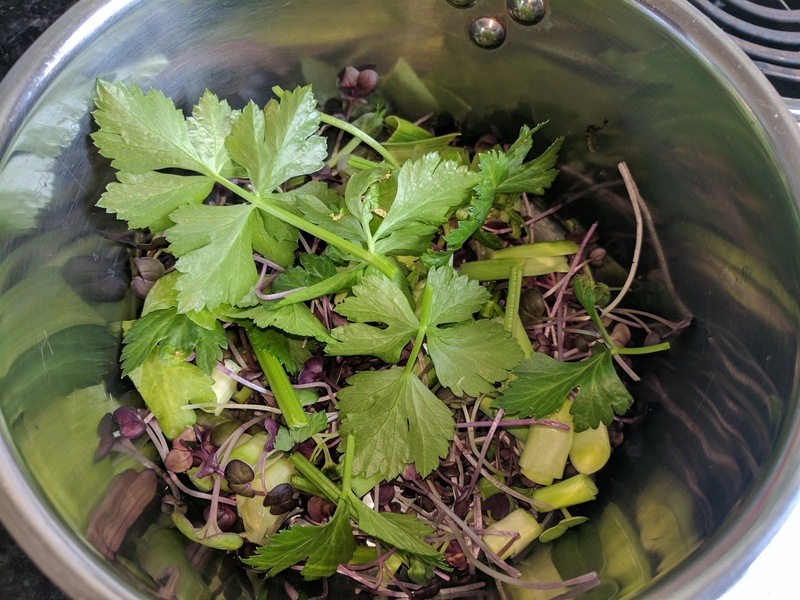 The other day I re-potted some of my celery so snipped off some of the leaves while I was doing that. Leeks. I've enthused about leeks in the past, and it's something I need to post on again because it seems they actually grow better in water than they do in soil, when you're re-growing them from the bulbs. 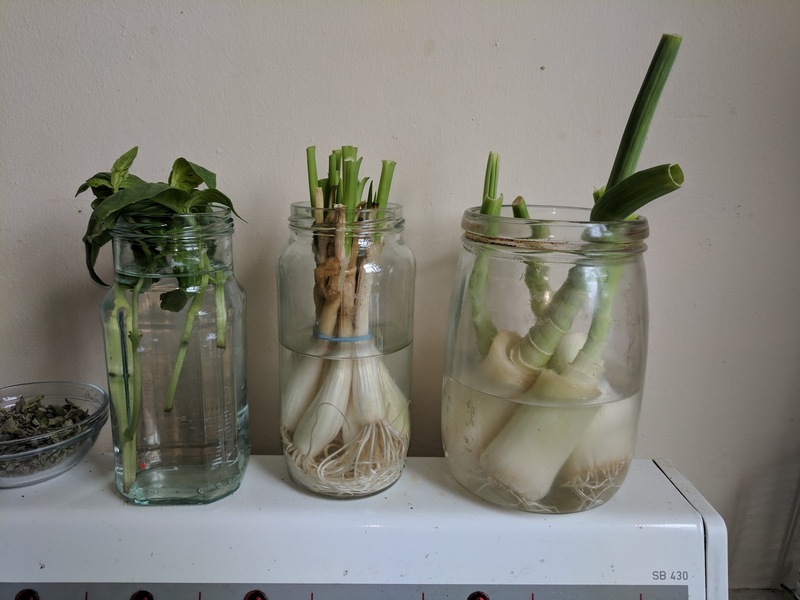 Basil, spring onions and leeks, regrowing in water in top of my oven. Mung bean shoots. It was nice to be able to put what was left of these to use. Beans and soup ingredients, ready for cooking. 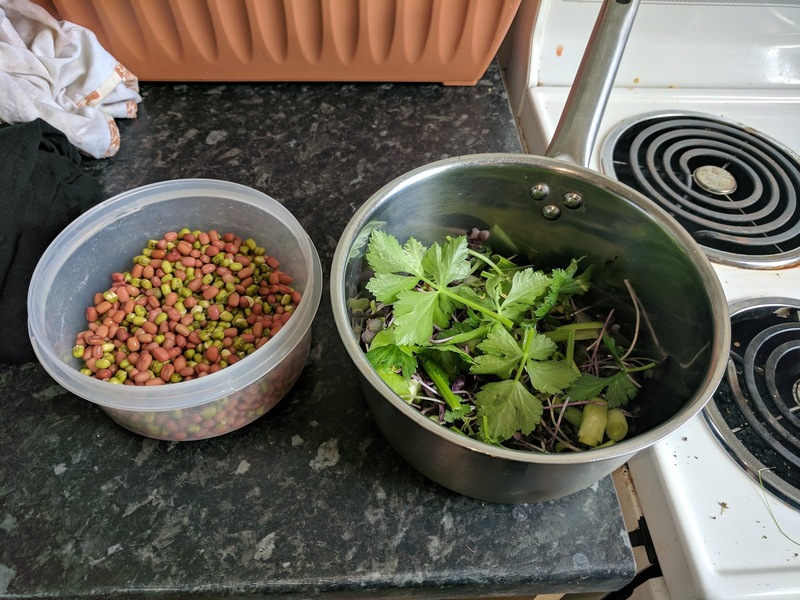 Mung bean and adzuki beans. Forgetting, like an idiot, that dried things usually expand when you put them in water, I was left with an excess of mung and adzuki beans from making up my new trays of microgreens. These formed the bulk of the soup and yes, aren't exactly "scraps" but in they went anyway. 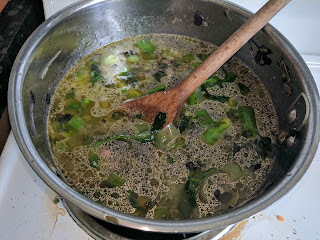 I sweated down the 'scrap' ingredients (everything apart from the beans) in oil for 2 or 3 minutes before adding the beans and water and bringing to the boil. Then I simmered for 15 minutes, added a little chilli powder for some extra bite (just a little, mind) and blended. 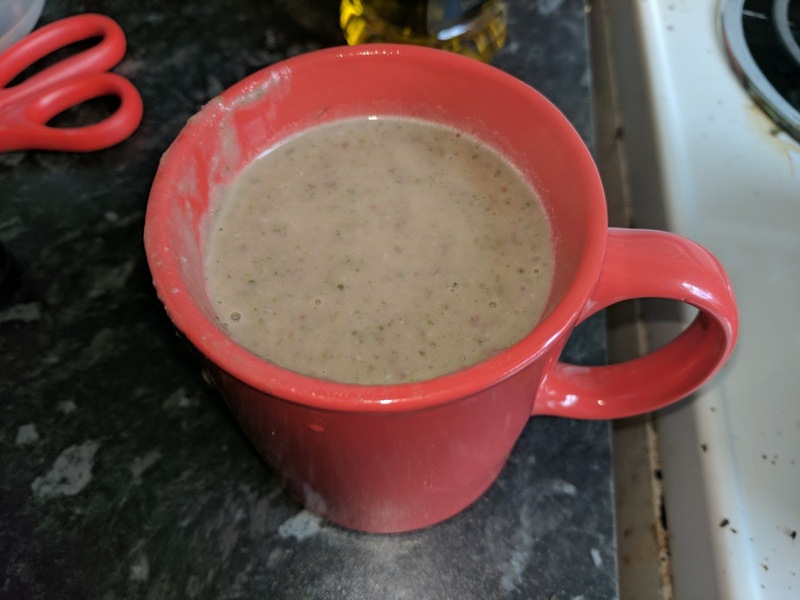 The colour may be a little offputting to some (similar to that mushroom soup, with a shade of purple) but the flavour more than made up for that. Thick and earthy, with a great balance of the sweet and bitter. And, needless to say, 100% vegan. I felt pretty pleased with myself, I have to say. In soup we trust. I have also updated my book this week. You can read some of it here, and about it here.